It was almost 3:00 in the afternoon when we sat down for lunch inside a restaurant in Karachi, Pakistan. I was sent on a trip by my team leader to this South Asian country and had been adjusting to the sights and sounds of the new environment. Coming from the Philippines, I assumed that lunch would be at 12 noon so I wasn’t prepared for this and neither to having dinner at past 9 in the evening (breakfast the next day was at 10AM). Another lesson learned in cross-cultural relations. The food we were served however hardly needed any adjustment for me. Nina and I have taken a liking to South Asian cuisine since we visited the Middle East in 1996. We like spicy food. Our team leader, Ivan Sikha, is Indian and often invited us to their home for chapati and chicken curry meals (Nina eventually learned to cook chicken curry from Papu, Ivan’s wife.) In front of me, in this Karachi restaurant were servings of naan, mutton biryani, chicken tikka and different types of kebab. After that meal I knew I wouldn’t have any problems staying in Pakistan for the next ten days. Pakistani food is similar in many respects to Indian food, being spicy and rich in flavors. Food from the Sindh and Punjab provinces is similar to North Indian cuisine while food in western Pakistan, including the provinces of Khyber Pakhtunkhwa and Baluchistan, is closer to the cuisine of neighboring Afghanistan. A pair of seekh kebabs and a chicken boti over a piece of naan: not in Pakistan but bought from a Pakistani-owned stall in Metro Manila. 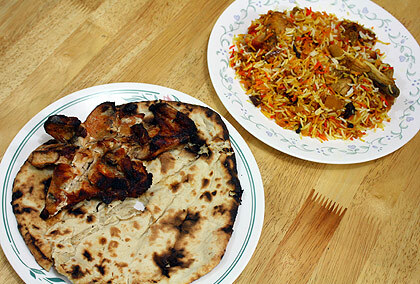 It’s the real stuff – the naan was actually cooked in a tandoor oven and took a while to prepare. 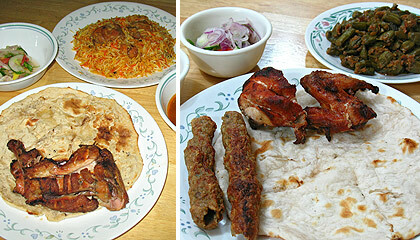 Pakistani food is meat-heavy compared to other cuisines in the Indian subcontinent. 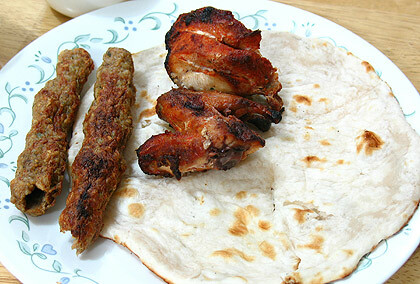 Lamb (mutton) and chicken are the most popular and beef is the preferred ingredient for kebabs. The latter comes in many kinds and forms but is basically meat barbecue marinated in a mixture of spices, lemon juice and yogurt. 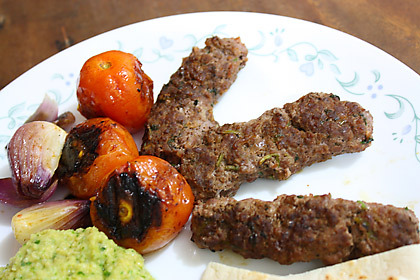 Seekh kebab is beef barbecue mixed with herbs and seasonings and usually served minus the skewer – easily my favorite. I’ve also tried and enjoyed Pakistani versions of lamb and chicken kebab. On one occasion I had fish kebab for lunch in Lahore. I was surprised by the latter’s taste since it resembled more of a meat dish rather than fish but tasted really nice. A chicken tikka with a piece of naan. Chicken tikka, one of my first South Asian favorites, is made by grilling small pieces of chicken in a tandoor oven and is often boneless. Tandoori chicken is chicken marinated in yogurt, seasoned with spices including masala and cooked in (where else but) a tandoor oven. Meat curries are also common in Pakistani. Many times a lot of ghee or clarified butter goes into curry preparation so some foreigners feel that these curry dishes are a little too oily. Korma is a meat curry that is rather thick and creamy. My biggest mistake when I was on a trip to Pakistan was eating curry for breakfast. Since I’m hyper-acidic my digestive system did not take too well to the dish but that did not stop me from eating curry at other times of the day. Vegetable dishes consist mostly of salads, dhal (a kind of stew made from lentils), channa (made from chick peas) and sauteed bhindi or okra mixed with spices and eaten with naan or roti. The sautéed bhindi happens to be my favorite South Asian vegetable dish. 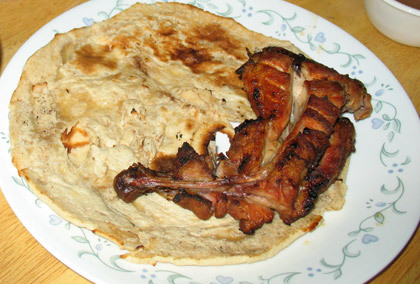 Pakistanis take the above dishes with bread in several varieties: naan, roti, chapatti and paratha. These are all flatbreads but made with different types of wheat flour and cooked differently. Naan is made from white flour, leavened and cooked in a tandoor oven. Roti is unleavened whole-wheat bread while chapati is a thin flatbread made from finely milled whole wheat flour with some ghee mixed in as it is being rolled. You can easily spot the difference in the type of wheat used: while rotis and chapatis tend to be a little brownish in appearance, naans tend to be lighter in color. Rotis and chapatis are usually cooked on a griddle or pan. Parathas are a little thicker and cooked in a pan with more ghee and are usually served for breakfast. 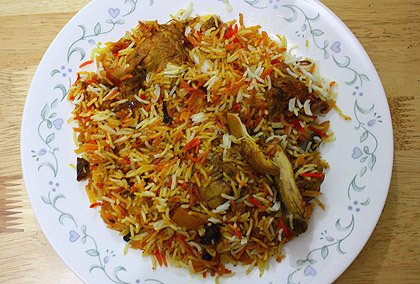 Chicken biryani. The Pampanga bringhi from the Philippines has its origins from biryani, which in turn traces its roots from Iran or Persia. Pakistanis also eat rice but not as much as eastern and southeast Asians. Basmati is the most popular type of rice and is identified by its long grain and fragrant smell. Biryani is a rice dish made by cooking rice and a thick curry sauce of meat and vegetables separately and bringing the two together in layers. The best biryani I have tasted in Pakistan was not at a restaurant but served at a house in Karachi. Pulao (pilaf) is a similar form of rice dish but cooked differently and is not a stand-alone dish like biryani. Incidentally, the best pulao I had tasted was in Peshawar in Khyber Pakhtunkhwa province which included nuts and raisins and was obviously Afghan-influenced. There were several times when I would see the locals eating biryani with plenty of yogurt. Later I learned that yogurt and other milk products remove the lingering effects of chili and other hot spices more efficiently compared to water or soda. No wonder I tended to gulp down massive amounts of lassi – a drink made up of milk and yogurt – during meals that featured plenty of hot, spicy dishes. Nina’s own version of seekh kebab. South Asian food has now become popular in western countries and other parts of the world, but Pakistanis too are trying out new foods. I saw several KFC outlets in Pakistan’s major cities even before 2000. And I remember eating at a Chinese restaurant in Lahore which Pakistani friends frequent. Still nothing beats the experience of eating in the traditional way as I did at a communal gathering in Mardan in the former North West Frontier province (now the Khyber Pakhtunkhwa) years ago. We gathered around the floor where food was served on a cloth known as dastarkhan and we ate cross-legged with our hands. There is something about eating with your hands that make the food taste better but having a shared meal with the local folks made it even more meaningful.